Bonaire designated the reef surrounding the island a national marine park in 1979. Long before it was the ‘in’ thing to do. 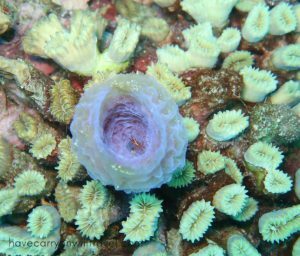 The result is a very healthy reef with such abundant life it is hard to find those unusual creatures. Debbie finds a small hairy crab stuck in a crack in a rock. Two squid are hanging about in the shallows. 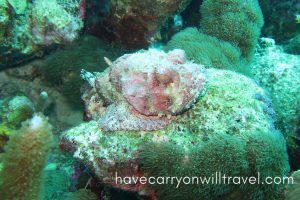 C & D stumble across a couple of Scorpion Fish. I find another juvenile Trunk Fish. But the rare stuff is hidden very well and we do not spot any. The dive sites themselves are quite pretty. 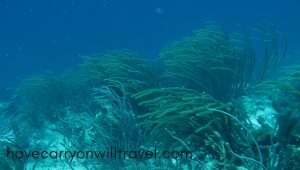 The first is a field of soft coral bent over from the current and so thick it is hard to swim near the surface of the reef. The second has a mix of soft and hard coral making for quite a surreal landscape. The third is almost exclusively hard coral looking like a boulder strewn slope in the mountains. When the wildlife hides we entertain ourselves ogling the landscape, it is so different from the sites you might see on the other side of the surface of the water. We also look into the blue (the deep water) keeping watch for larger life such as sharks, rays, tuna and turtles. Only a couple more days to explore this marvellous underwater world.